Find out if you're ready for a scuba dive in the open sea on this trial run in the safety of a swimming pool. 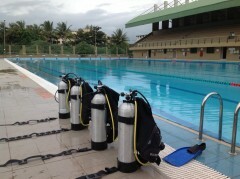 On this try dive in Pune, you'll pick up the right techniques needed to become an excellent scuba diver. Conducted in the confined waters of a swimming pool, this 2-hr session will teach you the basic skills of handling the scuba equipment and methods of navigating underwater. At the dive centre, located in Pune city, a certified instructor will take you through a range of skills from regulator recovery to mask partial cleaning. Designed for beginners, this fun and introductory session opens you up to the fascinating world of scuba diving, without having to travel far and wide in search of a dive spot. NOTE: This try dive in Pune will be conducted entirely in the comforts of a swimming pool. The dive centre, located in Pune city, is equipped with all the facilities required to train budding scuba divers, including a swimming pool for confined water training. The dive centre comes with all the equipment required for scuba diving, from a wetsuit to a regulator. The centre is easily accessible from all parts of the city via public transport. At the dive centre, you'll enjoy this 2-hr session and have fun diving in the confined waters of the pool. • Learn the basic skills of scuba diving on this try dive in Pune. Travellers are required to adhere to instructions of the dive instructor during this swimming pool try dive in Pune. For cancellations made more than 3 days before departure of the swimming pool try dive in Pune: 75% refund. For cancellations made 3-2 days before departure of the swimming pool try dive in Pune: 50% refund. For cancellations made less than 2 days before departure of the swimming pool try dive in Pune: No refund. The tour operator reserves the right to cancel or alter the itinerary of the swimming pool try dive in Pune to ensure maximum safety for travellers as well as staff. There is no pick-up for this pool try dive in Pune. There is no drop-off for this pool try dive in Pune. Swimming pool try dive in Pune!